I finally beat the Elite Four. It took me a couple of tries. Frankly, I felt that the Elite Four members were pretty easy (I remember wiping the floor with Koga on my GBC Gold Version, and this time was no different). Honestly the biggest challenge came from Lance, and I do feel there is a bit of a sudden jump in the degree of challenge the game presents here. I ended up going back and grinding for a bit. I traveled back to Dragon's Den to get the Dratini (which is now a level 35 Dragonair) and used my Master Ball on Entei (since all the other Legendaries will stay in one place when I face them, I'll rely on Ultra Balls). This is one of a very few points in Soul Silver where I really felt the need to grind for experience points. And as annoying as it was for a brief period, I'm rather grateful that the grinding has been limited, unlike in some other RPGs I've played. Ultimately, my plans to level up Dragonair into a Dragonite were scrapped in favor of using Gyarados as my dragon type to counter Lance's three Dragonites. Umbreon held his own surprisingly well against Aerodactyl, and both Lance's Gyarados and his Charizard were pushovers, thanks to Raikou and my own red Gyarados respectively. 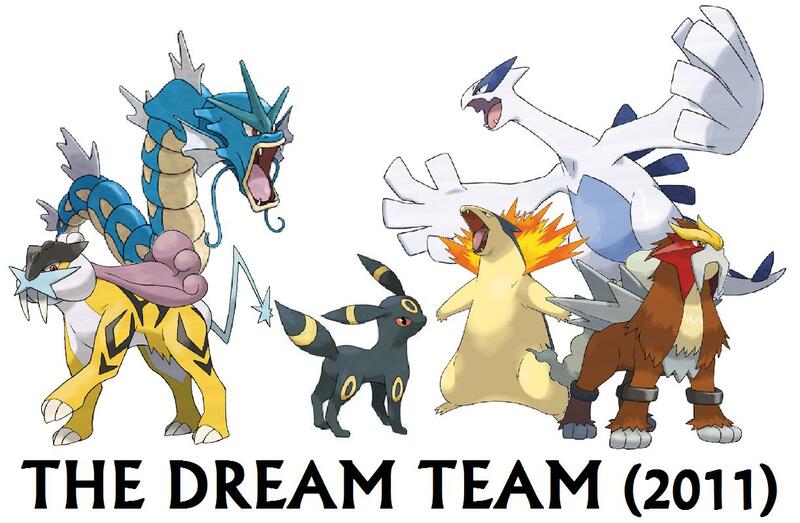 And so I present the 2011 Pokémon Soul Silver Dream Team - Raikou, Gyarados (actually red), Umbreon, Typhlosion, Lugia, and Entei. There's a bit more variety here than with my 2000 GBC Gold Version Dream Team. I'm surprised at how much I've warmed up to dark types. I've also used water types much more frequently this time around. My review of Soul Silver should be up within the next couple of weeks - if not before the end of the year, then shortly after the start of January 2012. Now if you'll excuse me, I've got a ticket to board the S.S. Aqua.